Earlier this week, I posted a picture on Instagram of my wrists decorated with drawings that inspired and made me feel happy and encouraged others to do the same in honor of National Suicide Prevention Week. There are many reasons that people draw on their wrists. Besides boredom and creative inspiration, drawing on one's wrists has a special meaning in the mental health community. There's the Semicolon Project, an organization that began when the creator wanted to honor a friend of his who had lost their life to suicide. It aims to inspire individuals who have suffered from any number of mental health issues, including self harm. The semicolon represents a sentence, or a life, that could have ended but didn't. Besides being something that is drawn on peoples' wrists, it is also a popular tattoo choice for survivors of suicidal thoughts. A semicolon isn't the only tattoo that survivors get. Getting a tattoo in celebration of surviving a mental illness is an awesome way to remind yourself how much you've been through, and that you came out okay on the other side. Take, for instance, Demi Lovato. 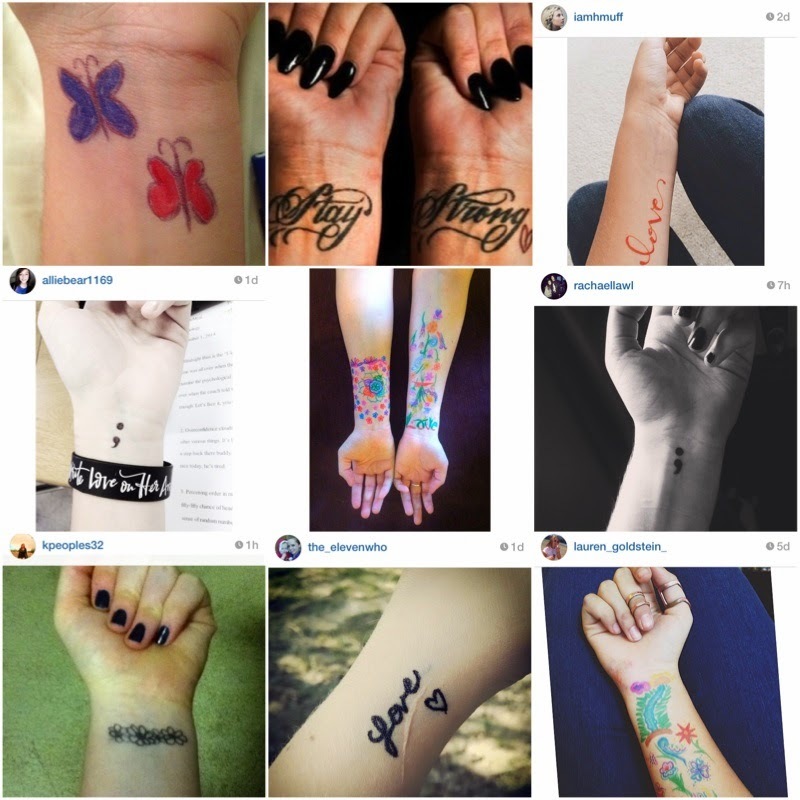 After going to rehab for her long-time struggles with bulimia and self harm, she inscribed "stay strong" on her wrists as both a reminder and a source of inspiration. Others get a butterfly tattooed on their wrist in honor of the Butterfly Project, a project which encourages those struggling with self harm to draw a butterfly wherever they feel like self harming instead of hurting themselves. Many self-help sites encourage drawing on yourself instead of hurting yourself; be it a butterfly, a semicolon, or anything else you can think of. The sensation of running a marker across your skin is meant to distract you from the desire to feel the sensation of self-harm. During National Suicide Prevention Week, TWLOHA encourages both supporters and survivors alike to write "Love" on their wrist to both support and raise awareness of the cause. Whatever the reason or inspiration behind the temporary body art, simply sharing it with the world and explaining your support of National Suicide Prevention Week spreads the light to those who might not know just how serious this cause is. As amazing and helpful as celebrity support and organizations like TWLOHA are, there still needs to be an active and widespread effort to prevent suicide and help those struggling with suicidal thoughts. In an age when mental health is finally starting to be recognized and treated properly, it's important to spread this awareness and incite dialogue in homes, schools, and even the government. It's important to keep an open mind, an open heart, and open your mouth about mental health so it can stop being so taboo and something can actually be done to help those struggling. Thank you to Lauren, Hannah, Allie, Rachael, Kim, and Sarah for the pictures.